Ask the Ageless Lifter: Does T-Therapy Work? 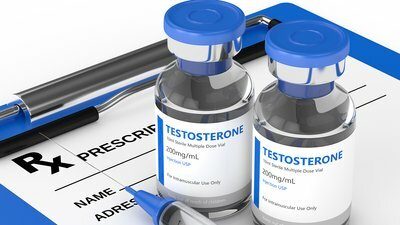 Wondering if legal testosterone therapy is the same as taking steroids? Will it make you an ageless animal in the gym? Here's the inside scoop from a lifter who's been there. Q: A lot of my guy friends are taking testosterone replacement therapy. Is it worth considering? Is it "cheating?" Both free and total testosterone levels tend to decline with age. This is totally normal and natural, but at the same time, it's no fun. And when you also like to train hard and lift heavy things on occasion, it feels unnecessary and suboptimal. When I first started considering testosterone replacement therapy (TRT) at age 50, my reasoning was: If I can raise my testosterone to normal levels safely and legally, why wouldn't I do so? And before I continue, here's the distinction between doing TRT and using anabolic steroids: When you're prescribed exogenous testosterone by a doctor, you'll be brought up to levels that are naturally occurring in younger men. When people take steroids, they are usually taking much more testosterone than what could occur naturally. So no, this isn't "cheating." It's a health issue first and foremost (and no, to be clear, I am not a doctor). Still on board? Let's dig in a little deeper. If you are considering TRT, here's a brief sketch of how it typically works at a dedicated TRT clinic: First, you make an initial appointment and have your blood tested to determine if you qualify. Your total testosterone must be under a certain number—this varies somewhat depending on where you live—in order for you to qualify for TRT. You'll also receive a cursory physical and a brief interview. Then, if your natural T levels are under the magic number, you'll return to the clinic, typically once a week (twice a month is also usually an option) for an injection, usually in your glute muscle. These visits should be done the same day of the week each week, but don't usually require an appointment. Each visit will take about 10-15 minutes start to finish, and the injections rarely hurt, although every now and then the needle might hit a nerve and yes, you'll feel that a bit. Some, but not all clinics will allow you to self-inject at home. Every 12-16 weeks, you'll have labs done to monitor your testosterone levels, as well as other common blood markers, such as hematocrit, estrogen, T3 and T4, triglycerides, cholesterol, and so on. If your total T levels drop below a certain level, your weekly dose will be slightly increased, and if they exceed a certain limit, your dose will be slightly decreased. Also, most clinics will recommend or prescribe hGC, or human chorionic gonadotropin, about three times a year. This involves eight weeks of twice-a-week subcutaneous injections, typically done at home. hCG prevents your body from shutting down its own testosterone production while you're on TRT. Most TRT clinics accept common forms of health insurance, as well as "out of pocket" fees which range between $200-$300 a month in most cases. Most guys will gradually start to notice the effects of TRT within 3-4 weeks, in my experience. You won't suddenly grow muscle and lose body fat without any effort. But you will notice an increase in overall energy and mood. Most guys find that they can train harder and more consistently—and that can definitely help you grow muscle and lose body fat. Libido and the ability to handle stress also improves. Overall, most guys simply feel younger, more energetic, and "vital" when they start TRT. That part of the marketing is at least somewhat legit. Nevertheless, don't expect TRT to change your life. But do expect it to make a noticeable difference, and help you thrive in a few more activities that can definitely make a positive impact on your quality of life. You'll need to continue your weekly injections indefinitely, if you want to continue seeing the results. Testosterone only works when you're taking it. So it's a long-term investment. TRT typically leads to testicular atrophy, although this can be largely remedied in most cases by hCG. Nonetheless, if you're a young man who plans to have children, special precautions may be in order, so talk to your doctor. There is some research indicating that testosterone therapy could increase the risk of heart attack or stroke in men 65 and over. [1,2] However, a number of more recent studies found no increased risk in men who received TRT for years on end. Some studies have even found that TRT helped elderly men reduce their risk of major cardiovascular incidents. [4,5] So this is an area of concern, but not one that's conclusive one way or another. Talk to your doctor about it. What I just said about cardiovascular risks also applies to prostate health. Most studies suggest no relationship between TRT and prostate cancer. The same goes for benign prostate enlargement. However, there hasn't yet been a be-all, end-all study on either count, and certain studies have found a higher rate of treatable prostate cancer (and a lower rate of aggressive prostate cancer) among TRT patients. So if you're looking for a conclusive answer, well, I'm sorry. Put this in the "talk to your doctor" bucket as well. There are various, and usually relatively minor negative side effects, including rashes, itching, some sleep apnea, and others. While these are all fairly rare experiences, a very common one is blood "thickening:" increased hematocrit and iron levels. Fortunately, this is easy to solve via occasional blood donations. Still, it's worth discussing with your physician. Finkle, W. D., Greenland, S., Ridgeway, G. K., Adams, J. L., Frasco, M. A., Cook, M. B., ... & Hoover, R. N. (2014). Increased risk of non-fatal myocardial infarction following testosterone therapy prescription in men. PloS one, 9(1), e8580. Anderson JL, May HT, Lappé DL, Bair T, Le V, Carlquist JF, Muhlestein JB. Impact of Testosterone Replacement Therapy on Myocardial Infarction, Stroke, and Death in Men With Low Testosterone Concentrations in an Integrated Health Care System. Am J Cardiol. 2016 Mar 1;117(5):794-9. Sharma R, Oni OA, Gupta K, Chen G, Sharma M, Dawn B, Sharma R, Parashara D, Savin VJ, Ambrose JA, Barua RS. Normalization of testosterone level is associated with reduced incidence of myocardial infarction and mortality in men. Eur Heart J. 2015 Oct 21;36(40):2706-15. Eisenberg, M. L. (2015). Testosterone Replacement Therapy and Prostate Cancer Incidence. The World Journal of Men's Health, 33(3), 125–129. Kathrins, M., Doersch, K., Nimeh, T., Canto, A., Niederberger, C., & Seftel, A. (2016). The relationship between testosterone-replacement therapy and lower urinary tract symptoms: a systematic review. Urology, 88, 22-32.